I saw Samantha speak at last year’s New York Times Travel Show, and I have to say, she comes across as probably the nicest semi-famous person I’ve ever met. She was bubbly, grateful, enthusiastic, but as I suspected, somewhat clueless when it comes to travel. I couldn’t agree more. Despite being undeniably likable, that only goes so far when you have to endure an entire hour spent with her locked within the confines of another cruise ship, or wandering the exotic backstreets of Epcot Center. Sorry Samantha, but my guess is that the new bosses are going to be looking for something a little more innovative to pump their bottom lines. Guess what happens when media conglomerates want to boost their lower valued properties? Bring on the celebs. With an entire staple of celebrities (I have no idea who Giada De Laurentiis is, but I do know of her), you can almost bet that we’re going to see some good ol’ fashioned cross-promotion. Ever wonder why so many ABC sitcom stars can be found in the stands during Monday Night Football? Expect to see many more chefs breaking out of the kitchen and launching their own side-shows on the Travel Channel in the upcoming years. 3. 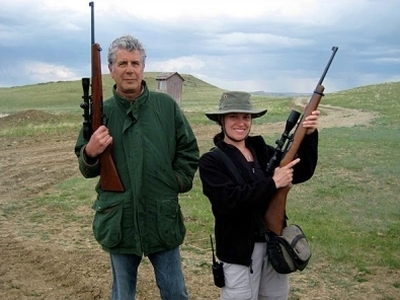 Anthony Bourdain: Time For A Little Respect? I’m not sure I’d go so far as to label “No Reservations” as the best, but I can safely say it’s “one of the best” shows on American television, as was proclaimed in that same Slate article. So perhaps now, with a little drive to pay back some of that huge corporate debt on the books, Anthony’s bosses are going to have more than a little interest in seeing that their sole hit show is going to be given the support it has always deserved. It’s a crime his show only garners a little over a million viewers an episode, what with so many lesser shows quadrupling that on rerun nights. Expect the head honchos to lock in Anthony for the foreseeable future and to finally promote the show in a way that is only reasonable given it’s potential. Although it’s still too early to tell, expect the newly-indebted bosses to cut some fat, expand with what they have, and promote their valued assets, but don’t expect anything too drastic in the near future. Although, I do know somebody who’s got a great idea for a new travel show pitch . . . I even promise to put some time in at the kitchen once a while. The Expeditioner Guide To French Cuisine? Has a certain ring to it, don’t you think?